Deliver this Stylish and Trendy looking Silver Plated Paan Shaped Puja Aarti Thali (52 gms). with 100 Gms. Assorted Sweets from Haldiram and Free Silver Plated Lakshmi Ganesh Coin. Note: Gross Weight applies for Sweets. Deliver this Stylish and Trendy looking Silver Plated Paan Shaped Puja Aarti Thali (52 gms). with 250 Gms. Assorted Sweets from Haldiram and Free Silver Plated Lakshmi Ganesh Coin. Note: Gross Weight applies for Sweets. Deliver this Stylish and Trendy looking Silver Plated Paan Shaped Puja Aarti Thali (52 gms). with 500 Gms. Assorted Sweets from Haldiram and Free Silver Plated Lakshmi Ganesh Coin. Note: Gross Weight applies for Sweets. 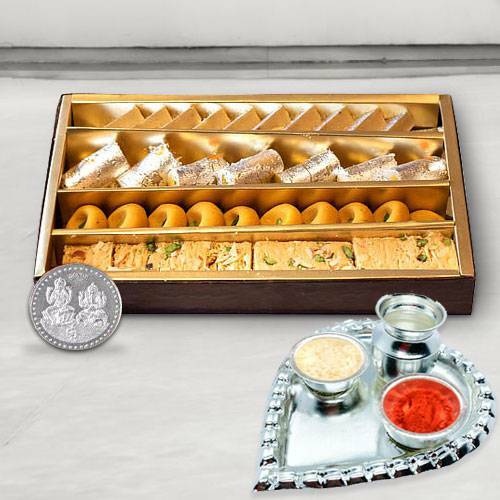 Deliver this Stylish and Trendy looking Silver Plated Paan Shaped Puja Aarti Thali (52 gms). with 1 Kg. Assorted Sweets from Haldiram and Free Silver Plated Lakshmi Ganesh Coin. Note: Gross Weight applies for Sweets.